← School Council Meeting This Wed Nov 21 – Join Us! Bowmore classrooms will be participating in the Dream Basket Fundraiser by collecting items to assemble in a basket, which will be raffled off at the Community Potluck on November 28. Each classroom has been assigned a theme. (Click here for PDF list of all the classroom themes.) 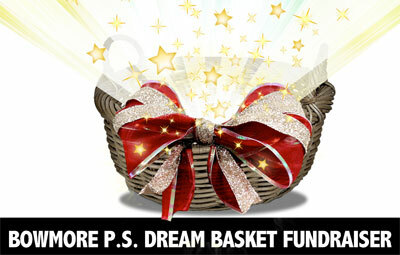 Children are invited to contribute to the basket by bringing in an item that would fit into this theme! The items can be big or small, but should be new. Collection continues through [UPDATED DATE: Wednesday, November 28 (morning)]. UPDATED NOVEMBER 27: Raffle tickets will be sold at the Community Potluck on November 28, and will be extended to include the daytime performances of the Primary Winter Concert to be held on December 10 and 11, where the dream baskets will also be on display. The draw for each basket will take place on December 11 and parents who are not in attendance at that time will be contacted by phone to pick up their basket in the office. These changes have been made in order to give as many parents the opportunity to participate as possible. Raffle tickets will be 1 for $2 and 3 for $5. If you would like to contribute to another classroom’s basket here are the themes: Toys Galore, Gourmet Chef, Family Fun, Relax & Unwind Spa, and Baker’s Dream.